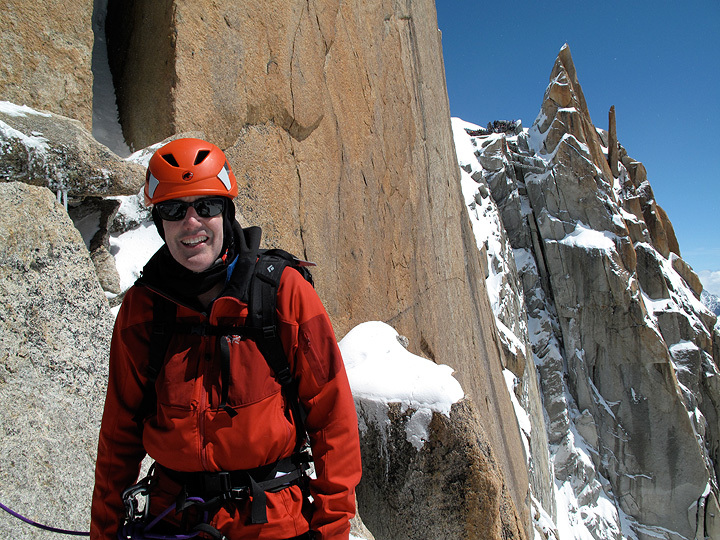 Bill Kind, who hails from the San Francisco Bay Area, joined Mark for 5 days, starting in the Berner Oberland and finishing in the Mont Blanc Massif. 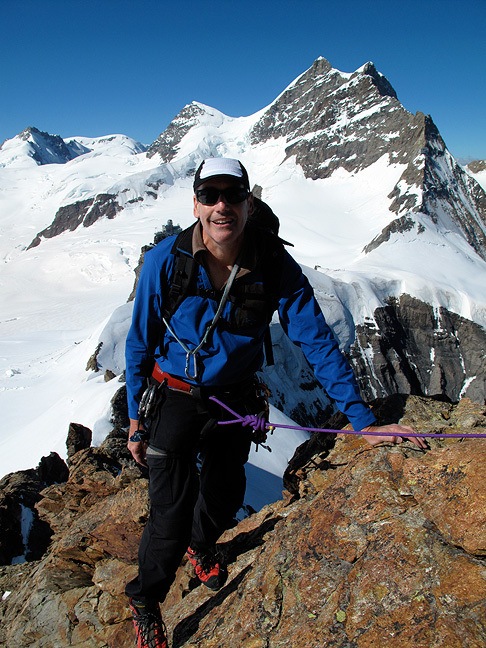 Originally our goals included the Mittellegi Ridge on the Eiger. 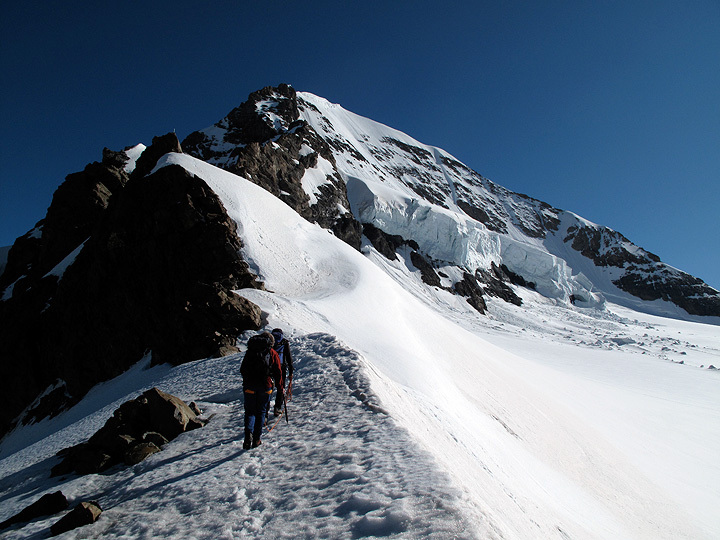 However, a thus-far wet summer has kept the route in rather snowy condition (the hut had not even opened yet). To add to that, on our scheduled day 2 the weather forecast called for a brief but intense and cold storm that ultimately brought us new snow all the way down to 2000 meters, with an accumulation of over 60 cm at 3500 meters. 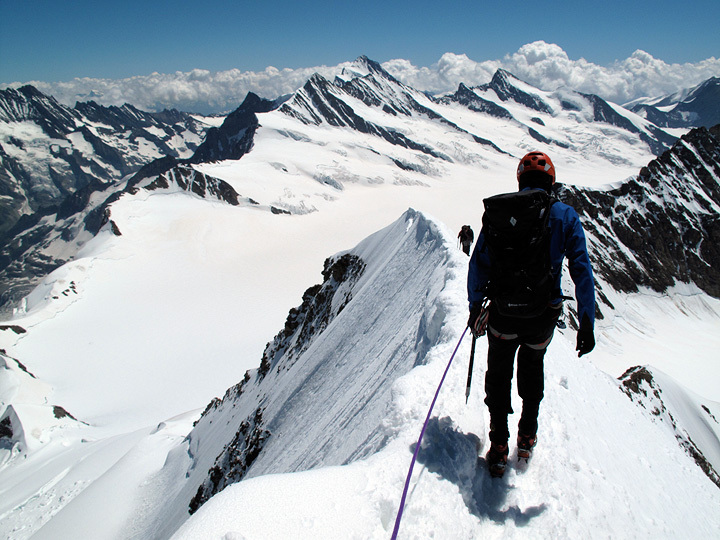 We decided to start with a day climb up the SW Ridge of the Mönch, and play it by ear from there. The calm before the storm. We had a beautiful day on the Mönch. The SW Ridge was in very good condition. 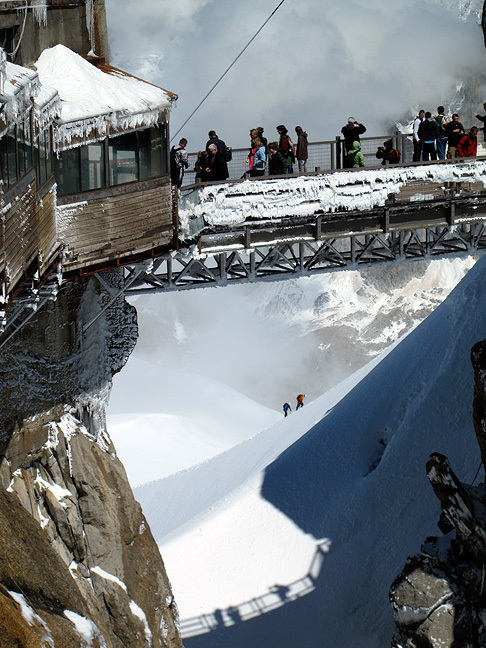 The Jungfrau is the big peak behind. The start of the SW Ridge of the Mönch. 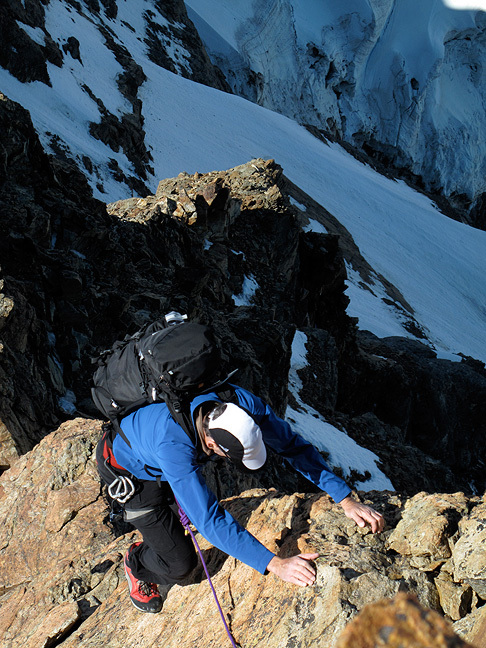 The normal route, and our descent route, the SE Ridge, forms the right skyline. 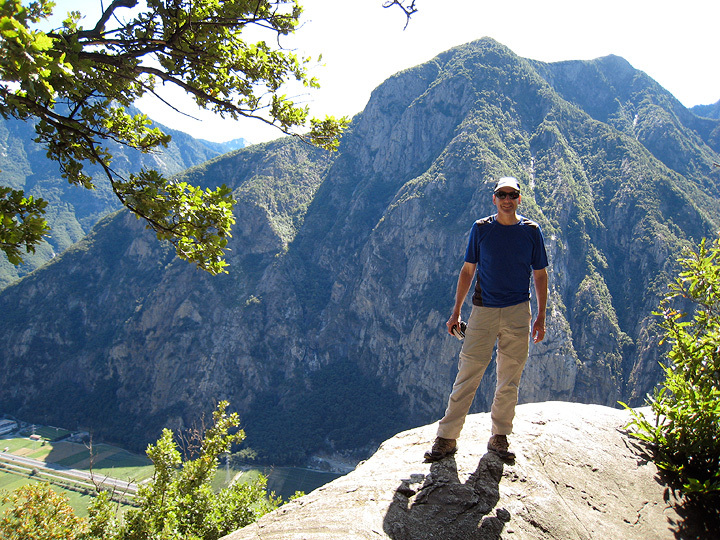 Bill on the fine gneiss of the Mönch. 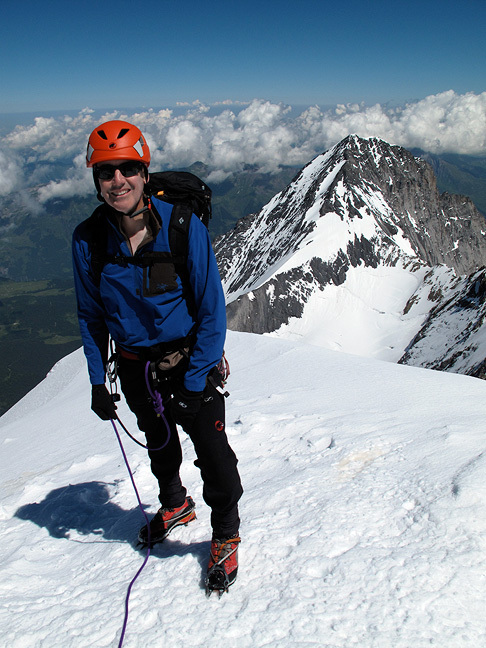 On the summit with the Eiger behind. Starting down the SE Ridge with the Finsteraarhorn behind. The following day was quite rotten. 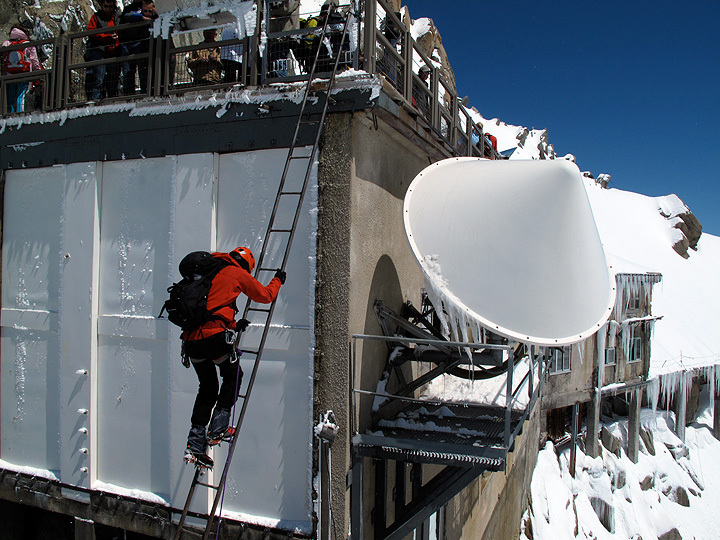 We decided to shift bases to Chamonix where we felt we had more options. On our third day, the weather pattern shifted slightly. While still coming in wet and cold, the flow was from the NW, which often yields drier skies on the Italian side of the range. 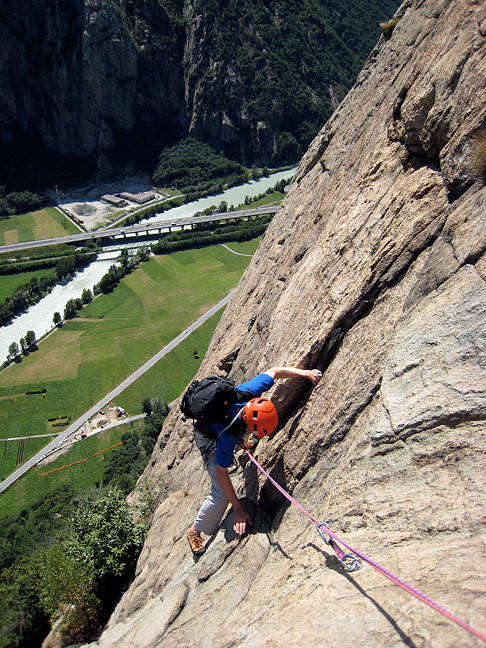 A quick trip though the Mont Blanc Tunnel, and drive down past Aosta found hot and sunny rock climbing at Machaby. 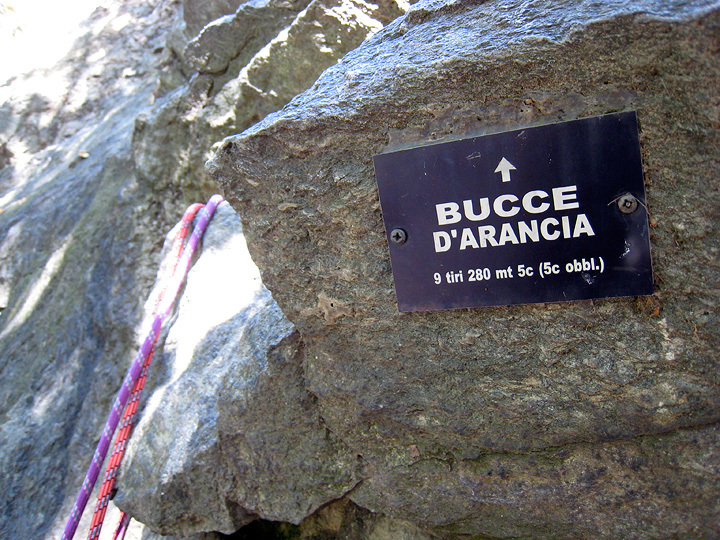 Our chosen route "Bucce d'Arancia" ("Orange Peel" in Italian) was, according to the sign, 9 pitches, 280 meters long with obligatory 5c climbing (about 5.9 in North American parlance). Bill climbs easily up the face, high above the valley. On the summit of Machaby. 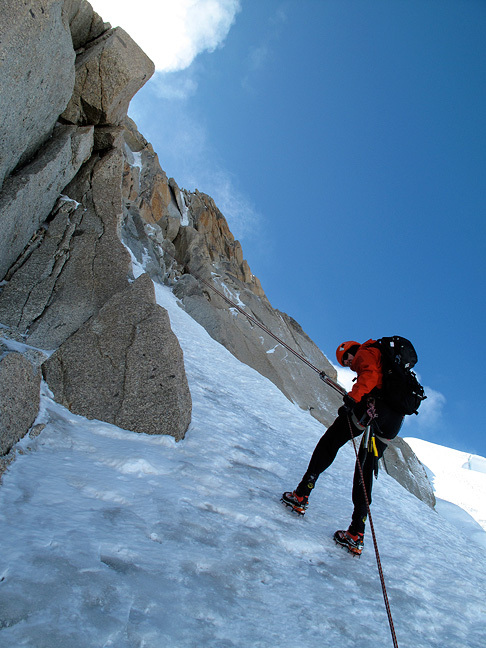 With 60 plus centimeters of new snow, our options for climbs the following day were rather limited. 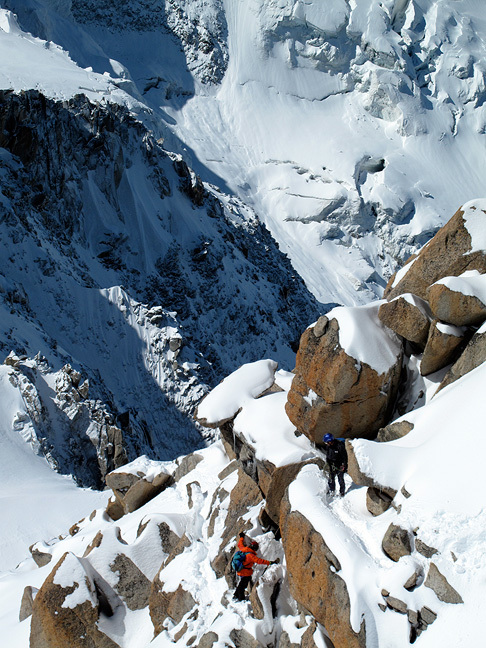 We chose the classic Arête des Cosmiques, generally safe from avalanche hazard and even more fun with a bit of new snow. 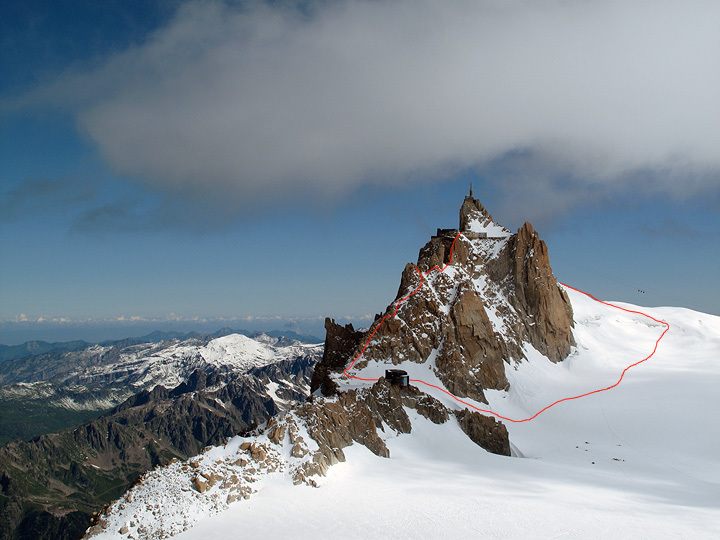 The route starts from the summit, reached via cable-car, descends the east ridge (on the right) circles under the South Face, passes the Cosmiques hut, and then back up the SW Ridge, the Cosmiques. A view from one of the terraces on the summit, looking down the east ridge and our descent route. 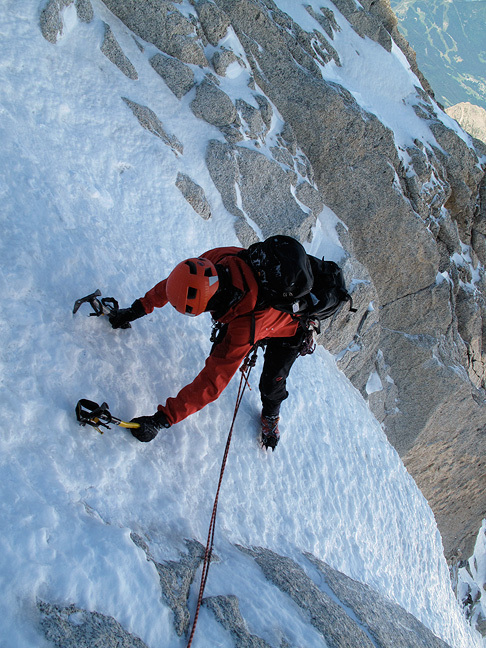 Climbers heading down the ridge. 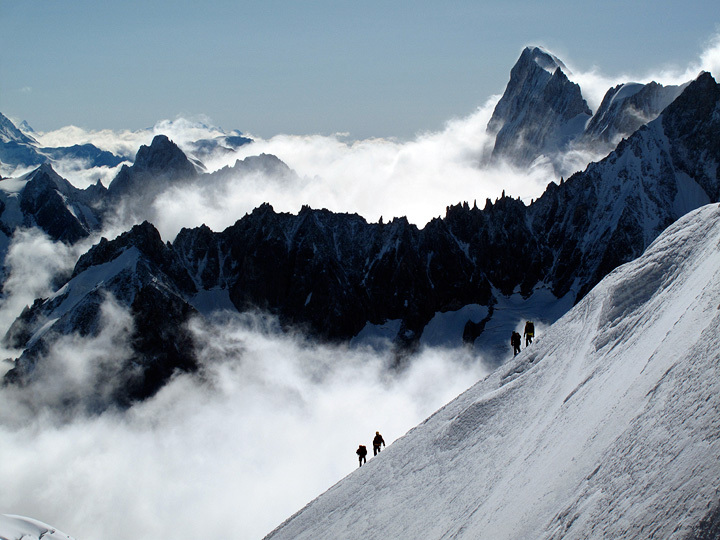 The Grandes Jorasses behind. 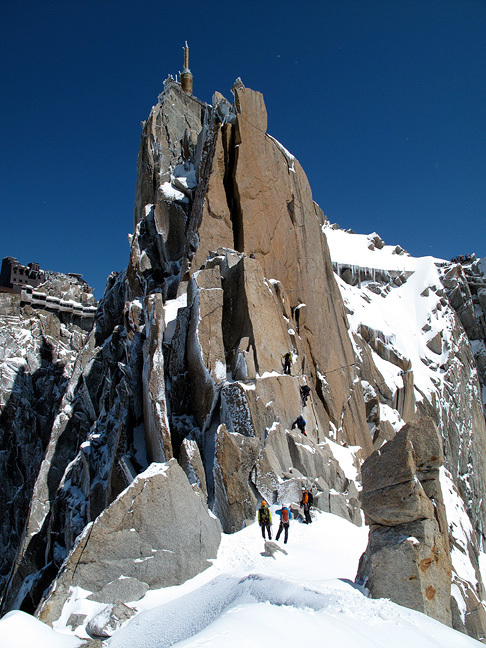 Another party not far behind us on the arête. Looking up at the final few pitches of climbing. The crux moves on the final tower. Same party, same position as the previous photo. Another shot of the same location, this one from the Panoramique cable-car. Bill tackles the last "pitch" to the deck. The following day, and our last, called for high winds and cold temps. 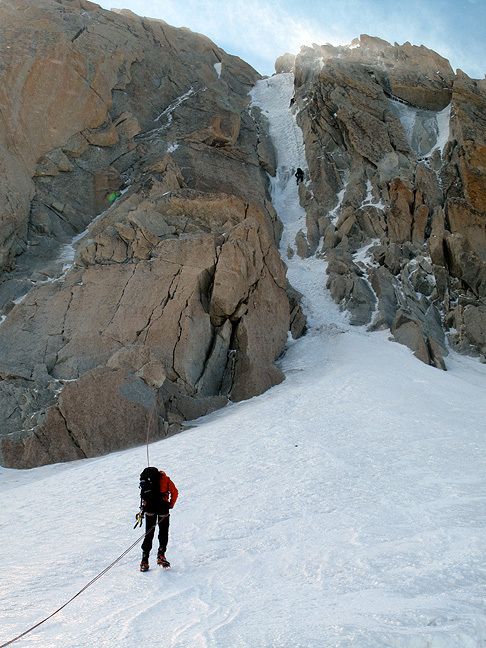 We chose to climb the Goulotte Chèré, a short ice route on the North Face Triangle of Mont Blanc du Tacul. 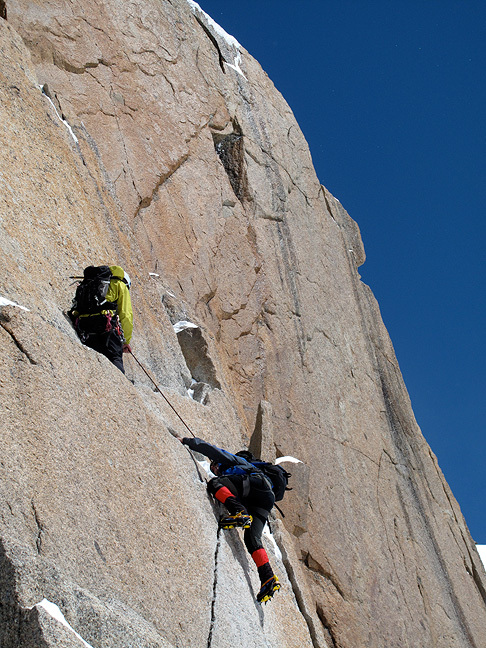 In this photo we are rappelling down the first pitch after our climb. 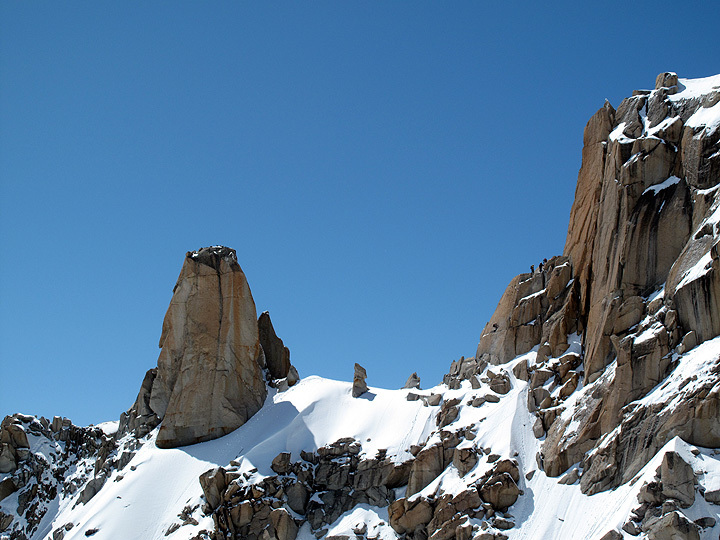 Climbers can be seen on the third, above. You can see the wind blowing hard little snow pellets across the route. Topping out in the Goulotte. And a quick, if breezy, descent.